Why? Why not? Skydiving seems like something that you must do at least once in your lifetime. Not only does it promise through-the-roof adrenaline, it also gives you a certain degree of boasting right. In fact, afterward when we told a bartender what we accomplished, he gave us, my sister and I, each a free shot. Wait, hold it man. I might get hurt, or even worse, die? My heart skipped a full one minute beat, but I signed the forms. I mean, what was I to do? If I didn’t sign the forms I cannot jump, and if I signed the forms… Well, let’s just say in the beauty of a catch-22, fingers crossed, eh? After a brief instruction-and-practice session, our group of six piled into a tiny airplane and took off. It was fun at first. I even enjoyed the view. But when my instructor opened the plug door, and a gush of wind twirled in, I started panicking. Mildly. Wait, are we jumping first? Wait, why are we jumping first? Wait, why aren’t you saying anything? Wait! It was f***ing scary! My mind went literally BLANK! I arched my back instinctively, my fingers grasped tightly around my straps. All I could think about was how much air there was, and such wind! It wasn’t until I glanced down and saw the video cam that I regained my composure. Instantly I was reminded that I was being recorded and that I must look good (hey, recording was an extra $75). Engulfed by vanity, I concentrated on controlling my facial muscles but it was impossibly windy. Blasted! But I looked good! Oh YEAH! Landed. My knees felt wobbly. We were presented with certificates that read “(name) exited the aircraft at 13,000 ft. and reached speeds of up to 120 m.p.h. before deploying the parachute”. Thankfully, skydiving is one of those once-in-a-lifetime thing. Did it. Cross it out. Done. 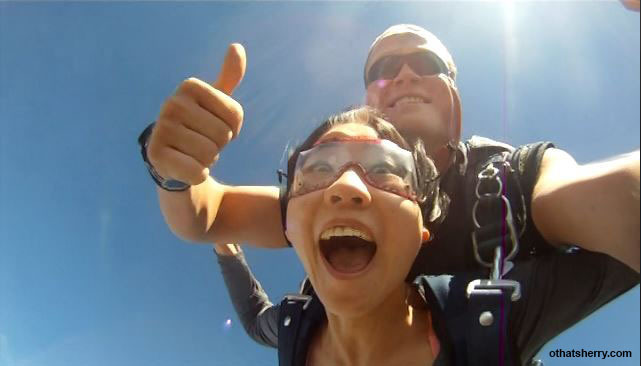 This entry was posted in Travel, United States + Canada and tagged san diego, skydiving on March 31, 2013 by Sherry. Oh, the British in me loves this line.